The Belvedere Palace of Vienna is in a unique location as it was built on a slope in the center of a magnificent park. Known as the Osterreichische Galarie Belvedere, the palace was the handiwork of Baroque architect Johann Lukas von Hildebrandt. This structure served as the Imperial throne’s gift to Prince Eugene of Savoy. The Prince is well known as Austria’s greatest martial hero primarily for defeating the Ottomans in the late 17th century. 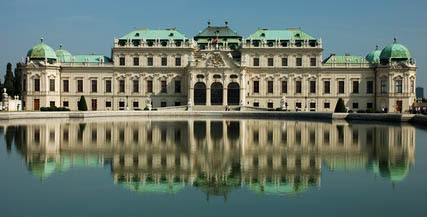 There are actually two palaces on the Belvedere complex. Museums are in place inside both buildings. The Austrian Museum of Baroque Art is located in the lower palace and showcases Austrian Art dating back from the 18th century while the upper section has a gallery displaying Austrian paintings in the 19th century to the 20th century.